Vye-Brown, C, Crummy, J, Smith, K, Mruma,A and Kabelwa H. 2014. 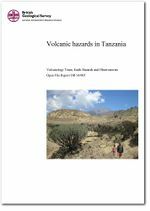 Volcanic hazards in Tanzania. Nottingham, UK, British geological Survey. (OR/14/005). This page was last modified on 20 June 2016, at 14:08.